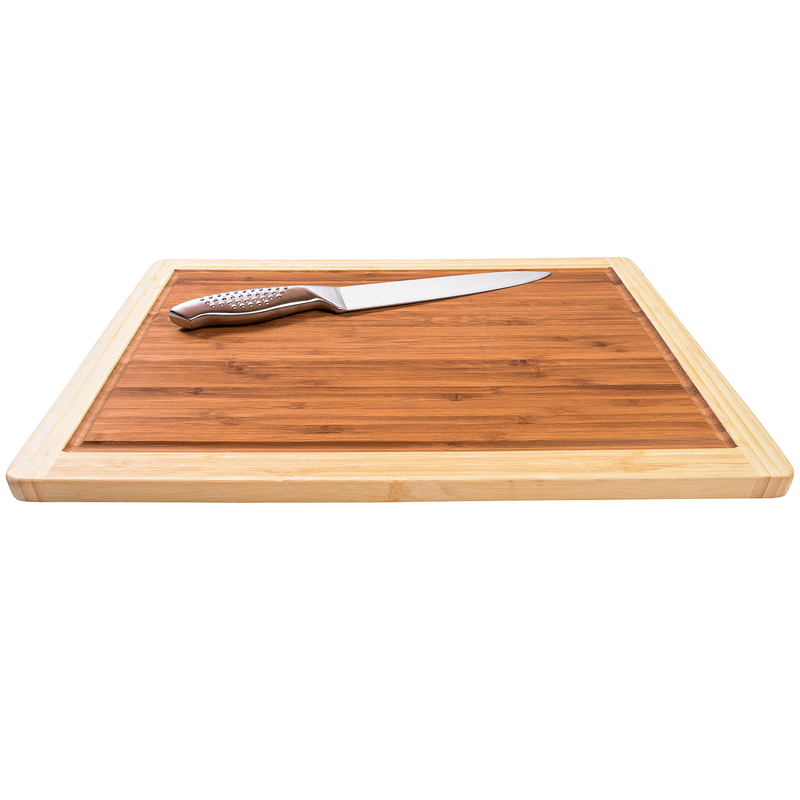 Made of the highest quality bamboo, these cutting boards are naturally antibacterial/antimicrobial, FDA grade, BPA and toxin free. This 18" x 12" multipurpose bamboo board is perfectly sized for cutting meat, bread, cheese, fruit and vegetables, and using as a serving platter. Each cutting board is made with unique branding on one full side. There are 7.5", 8.5" and 9.5 inch circles for easy pie making, and 5" circle for making tarts. Also branded on the same side is a 16" ruler along the top, and a 10" ruler along the side for easy ingredient measuring. The reverse side of the cutting board is smooth and perfect for dicing, slicing and cutting. This smoother side also has a drip groove on all 4 sides to prevent any liquid from dripping off the board and damaging expensive counter tops. These natural bamboo cutting boards are easy to use, maintain and keep at its natural sanitary surface. These boards are long lasting and more durable than any other wooden kitchen items on the market. Two toned wood with a beautiful fine grain, these necessary kitchen additions are crafted to leave on countertops all year round. 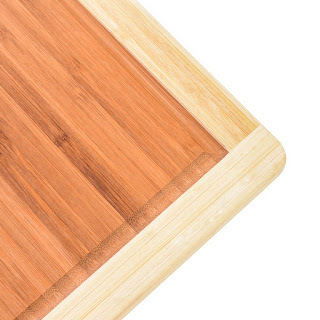 Culinary Corner bamboo cutting boards should be in every kitchen. 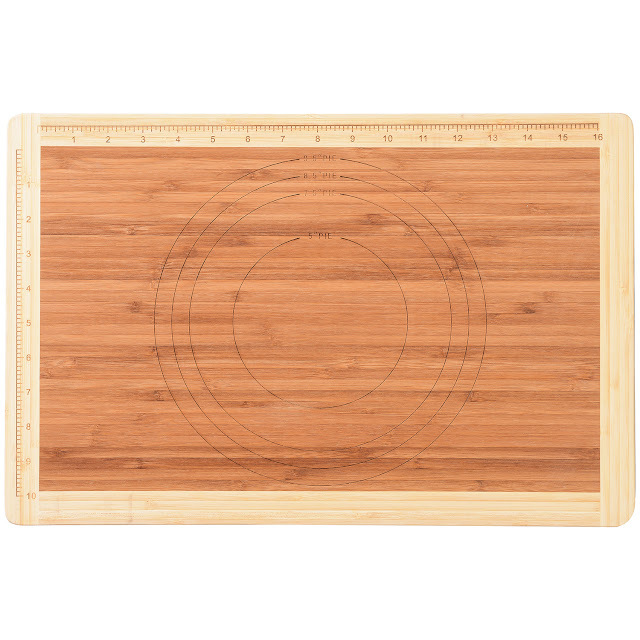 We offer the finest bamboo cutting boards that are eco-friendly and a natural renewable resource. People who have never used bamboo products before might not know that bamboo is not a tree, it is actually a fast growing form of grass which can attain at least several inches of height in a day and can be ready to harvest within 3 years. This makes our bamboo cutting boards very "green friendly" and a very renewable resource which helps our planet stay beautiful for future generations. 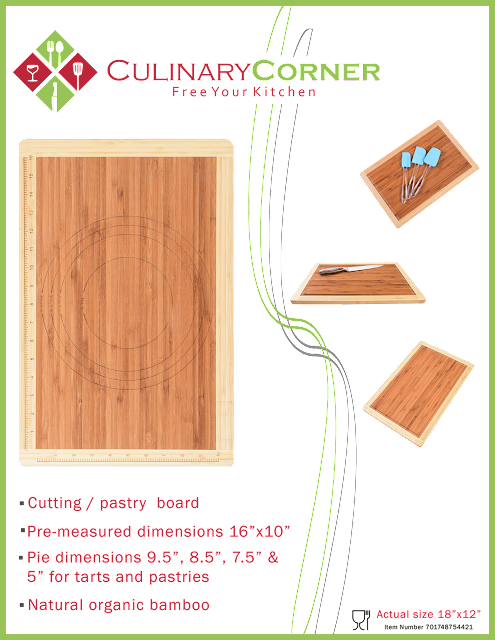 Culinary Corner uses only the finest durable bamboo that you can feel confident about using in your family's kitchen. Those who love to cook and create in the kitchen have often chosen cutting boards made from traditional dense woods in the past such as maple, cherry or walnut. Bamboo cutting boards are also naturally dense making them resistant to scratches, nicks and accidental scarring, which can lead to microscopic pockets where bacteria can form and grow. Our cutting boards also resist staining from acidic foods such as fruits and vegetables. This is why those who are passionate about their food and what they present to their families are turning to bamboo products. We recommend that before your first use and every use after, washing your cutting board with hot soapy water, rinse well and wipe dry immediately, or to sanitize after cutting raw meats like poultry, beef etc., we recommend using 1 tablespoon of bleach to a gallon of hot water. We want your cutting board to withstand the test of time and ask that you please do not put our cutting boards in the dishwasher. Should your cutting board ever start to dull just wipe it down with mineral oil or beeswax. Our natural bamboo cutting boards are two toned wood with a beautiful fine grain, in fact our cutting boards are so beautiful you will want to proudly display them in your kitchen. wooden chopping boards for sale at shop.arousingappetites.com.